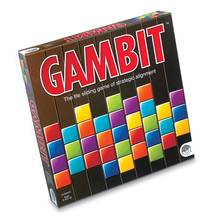 We collaborated with one of the world's most famous puzzle and game inventors to bring you Gambit. Try to unscramble the squares, forming nine rows of single-color tiles. Sounds easy, but if an opponent spots your strategy, your tiles could be slid off track! Includes 11" square game board, 2 sliding platforms, 14 scorekeepers and 35 playing tiles. 2 players.